iThanks. How Steve Jobs Changed My Life. On the evening of August 24th, 2011 I was hit with a profound sense of loss, as if part of me had simply fallen away and disappeared. I am not certain how the offending sensation started, it may have been via a news alert delivered from my television. I would not be surprised if it was a push notification from my iPhone. To be sure after receiving the news I investigated further on my MacBook Pro. Little detail was available at the time, but it was clear that Steve Jobs had indeed, officially resigned as Apple Inc.’s CEO. The day that I had been privately dreading for some years had finally arrived. I am not ashamed, and freely admit, that I wept over the news that evening. You see, Steve Jobs changed my life. It all began when I decided to change my career path from Psychology to Graphic Design. This decision was made in 1998 when I started taking classes at a local community college. After my first course in advertising design (not a computer related course) I was informed that my next course should be Intro. to Macintosh. I believe my response was “what the hell is Macintosh?” In those days I was in no way interested in using a computer. I was also unaware, until after completing my first course, that if I wanted to be a Graphic Designer I was going to have to spend at least a healthy portion of my time on a computer. I had just learned my first Graphic Design history lesson and found myself surrounded by the desktop publishing revolution which was in full swing and growing. Fast forward about 6 months and it’s a Saturday morning in June. I am enjoying my morning coffee on my deck with a short stack of Macintosh magazines and mail order catalogs – Mac Today, MacWorld and MacMall (or maybe it was MacConnection). I had been in the Intro. to Macintosh course for several weeks. That summer I was simply astounded that I was able to use, and enjoy using, a computer and I was trying to decide on what kind of computer I should buy. My instructor said to get a Mac, my class mates were leaning Mac but some said PC was fine. On this particular morning my next-door neighbor greets me from his deck. He is a computer specialist for the government and I told him I was thinking about getting a Gateway computer because I couldn’t afford a Mac. He tells me that if I’m going to do graphics I should just get a Mac, but no matter what, do not get a Gateway. I couple weeks later I arrived at my home with a “Bondi Blue” iMac. For the remainder of the year I was immersed in the world of Macintosh Computers and Adobe Software. I couldn’t learn enough. I read every magazine I could get my hands on and made good use of my newly acquired internet connection. Enter Interim CEO (iCEO) Steve Jobs. Despite all this evidence that I was becoming a Mac fanatic I did not reach nirvana until streaming my first Apple Keynote event. I was not quite prepared for the presentation. I can’t imagine what it would have been like to have been there live because I was blown away just over my 56k dial up connection. I watched this man come out on the stage and start talking about how the last financial quarter has treated Apple Computer (back then that was a rather short commentary). Then he started talking about the current hardware and software offerings and how they tie into the overall business strategy. And then, it was the moment that everyone present had come to see. The introduction of new hardware and/or software. I can ‘t remember what was introduced (perhaps the very first iBook) but I can tell you I was riveted to my computer screen. This guy was mesmerizing as he cleverly went through each new product or upgrade, and just when you thought he was finished …he would look down at the stage floor and pause for a moment before saying “but… there’s just one more thing…” the audience would laugh and applaud and Steve would announce something else. I felt like I had just watched a rock concert complete with an encore! I added Steve Jobs to my list of Macintosh topics to research and moved forward with becoming a Mac fanatic. I enjoyed every keynote and special announcement from Apple, and Steve since. It has become part of my evening routine that if Apple makes an announcement on a given day I will take time to watch it that evening. Over the years Apple Computer, Inc. (Apple, Inc.) has remained an important part of my life. Not just that I use Macintosh computers both at work and at home. I follow Apple news and try to keep up with what is going on in the industry(s) that Apple is involved with. I care about Apple because I can’t imagine using any other product(s). I will always have an Apple laptop and even an Apple desktop computer. I will always have an iPod to keep my music with me when I’m on the go. This year I finally joined the ranks of iPhone users and from now on my phone company will be Apple, Inc. I’m sure it will be a matter of time before I realize that I can’t possibly live without an iPad either. The products are designed with a humanist sensibility that makes technology fun. Because of this I have promoted Apple in my daily life since 1999. I have converted friends and family members from Windows PCs to Macs. I have also introduced some to their very first computer, always a Mac. I simply can’t imagine a world without Apple and I know I’m not alone. I think that Steve couldn’t imagine a world where technology could be so cold and impersonal that people would avoid it’s benefits. Technology can make life better, it can make life easier and it can benefit humanity. Apple was created to take the cold impersonal edge off of these great things. That cold and impersonal edge would have prevented someone like me from pursing my dreams, in fact it may have prevented the desktop publishing revolution and Graphic Design as we know it today. For these and so many other things I am indebted to Steve Jobs. As I said earlier, he changed my life. In 2005 I took a trip out west to visit a friend of mine, the previously mentioned neighbor who encouraged me to get a Mac. As I sat in the terminal at the Las Vegas Airport I pulled out my PowerBook laptop. As I waited for it to boot up I looked around at my fellow travelers and I noticed the Apple logo glowing in various corners. Maybe 3 or 5 other Mac users in my midsts. I remembered a time just a few years prior that I would have been the only one. I then over heard a lady as she leaned over to her husband and said “everyone has these Apple computers now.” I smiled and realized that I was part of that. I have lived this way for more than a decade. 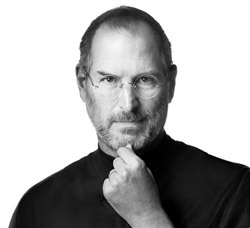 During that time I have come to realize that I can’t imagine a world without Steve Jobs. The hardest thing about the past month or so has been coming to terms with the possibility of that world. The hardest thing about the past 24 hours has been accepting that I am now living in that world. And, the pain of that realization will be with me for a long time to come.